In this post we will see two of these - reduce() and collect(). As you can see they are reduction. They reduce stream to an object. Lets see each of them is detail now. As you can see the 1st method gets the identity, then uses the 1st element of the stream and operates both to get a result. Then it takes the result and the 2nd element to process again and so on to finally return a result. 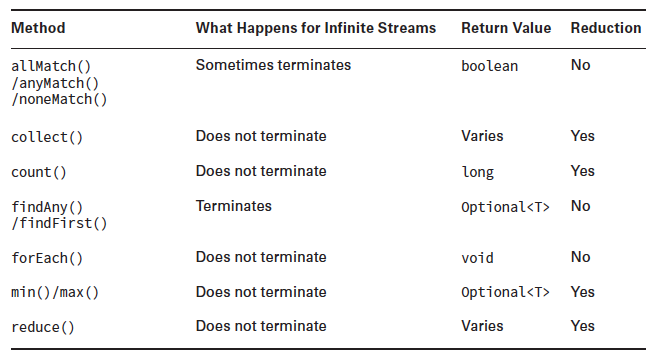 If the stream is empty, an empty Optional is returned. If the stream has one element, it is returned. If the stream has multiple elements, the accumulator is applied to combine them. 3rd method is used mainly when parallel Streams are involved. In that case you stream is divided into segments, accumulator is used to combine individual segments and then a combiner is used to combine those segments. combiner.apply(identity, u) is equal to u . The accumulator operator op must be associative and stateless such that (a op b) op c is equal to a op (b op c) . The combiner operator must also be associative and stateless and compatible with the identity, such that for all u and t combiner.apply(u,accumulator.apply(identity,t)) is equal to accumulator.apply(u,t) . multiple elements in the stream, resulting in very unexpected data. So above properties should be obeyed. For using collect() on parallel streams make sure your mutable container is thread safe. You can use concurrent collections for this. Here we are creating a map with key as length of the element in the stream and value as the element itself. This is because we have given (a,b) -> a+ " " + b which bean if there are two elements mapping to same key concatenate them using a space and out it in the for the corresponding key. If you have immutable values such as ints,doubles,Strings then normal reduction works just fine. However, if you have to reduce your values into say a List (mutable data structure) then you need to use mutable reduction with the collect method. In the case of reduce() we apply the function to the stream elements themselves where as in the case of collect() we apply the function to a mutable container.